1. Adding a knife rack on your wall will help keep them organized and out of your counters. 2. Build some shelving for cans and bottles if you don’t have enough space. 3. 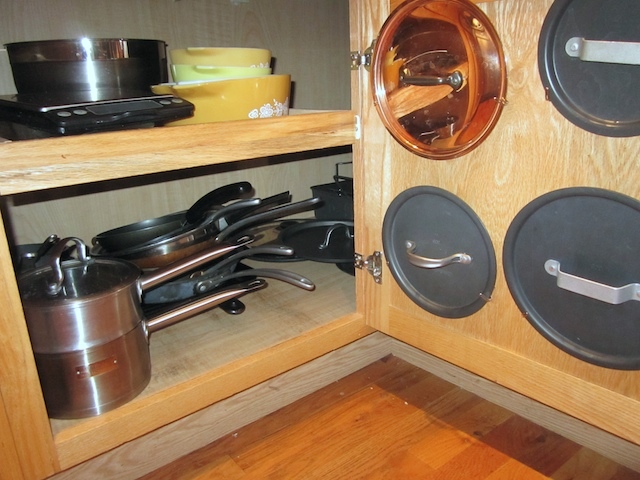 Use adhesive hooks to hang all the pot lids on the inside of the door to the cabinet. 4. You can make use of a roll-out pantry in between the wall and your fridge if you have space. 5. You can install pegboard to hang pots and pans on your walls. Kitchen storage can be a bit difficult, but with the right application of improvements you can get around the awkward shapes of most kitchen utensils and cookware which make them hard to store if you have a small kitchen. 6. You should store extra sheets under your mattress if you have no space in your bedroom. Plastic bins can be an excellent way of hiding things under your bed while keeping them safe at the same time. 7. You can also find an alternate solution to that by buying a bed with some built-in storage. 8. If you want to save up on closet space, then get in the habit of rolling up your towels. You’d be surprised to find out how much space you can save that way. 9. If you need more space, then you can always try to add more shelving to the bedroom walls. Depending on the nature of what you need stored it may even look great, such as books. 10. Place behind the door shoe holders to various other uses, these are not just for shoes.